Linux is powerful with command line, no doubt about it but with few packages you can beat it in graphics to MAC OS and Vista. Now lets see the power of a program called screenlets. With it, you can put widgets on your desktop. Check preview below. This will install screenlets on your system. Now go to Accessories->screenlets or simply run screenlets-manager from terminal. There you will find many screenlets. Double click them or select start/stop to start them. Select Auto start to start the selected screenlets automatically at logon. Window->Lock This locks the position of screenlets making them unmovable. Window->Sticky This makes your screenlets appear on all workspace. Window->Widget This makes you screenlets like dashboard in Mac OS X. RUN csm(compiz setting manager), search for the option widget in top left corner and enable it. 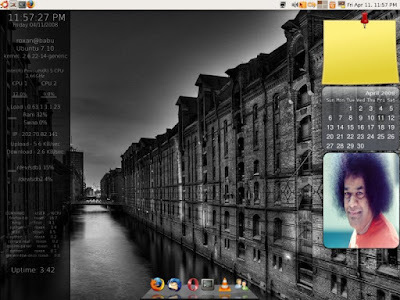 Now change your screenlets to widget. It will disappear but appear when you press F9 key. Goto screenlets.org for more screenlets. Also, now you can use Google gadgets, and other gadgets and web application as your screenlets. On screenlets-manager select install and select the required option. Here's what screenlets.org have to say regarding them.